Canidates for Hidalgo County District Attorney, Rene Guerra, left and Ricardo Rodriguez, listen to a question posed by a question moderator during a candidate forum at the Salvation Army Center Thursday, Jan. 25, 2018, in McAllen. 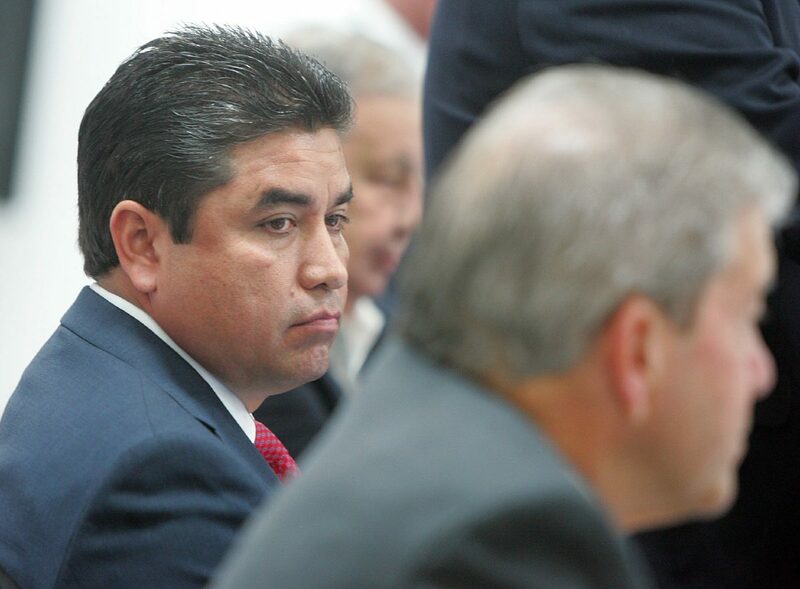 Incumbent Hidalgo County District Attorney Ricardo Rodriguez raised nearly $197,000 in political contributions in 2017 compared to the $2,000 contributed to Rene Guerra. Rodriguez has also outspent his opponent 10 to 1 in political expenditures, according to campaign finance reports filed July 15, 2017, and Jan. 15 of this year. This period covers 2017 between January and December. Rodriguez, who unseated Guerra in 2014 after winning 64 percent of the vote, received contributions from many law firms and solo practice attorneys, in addition to bail bond companies. 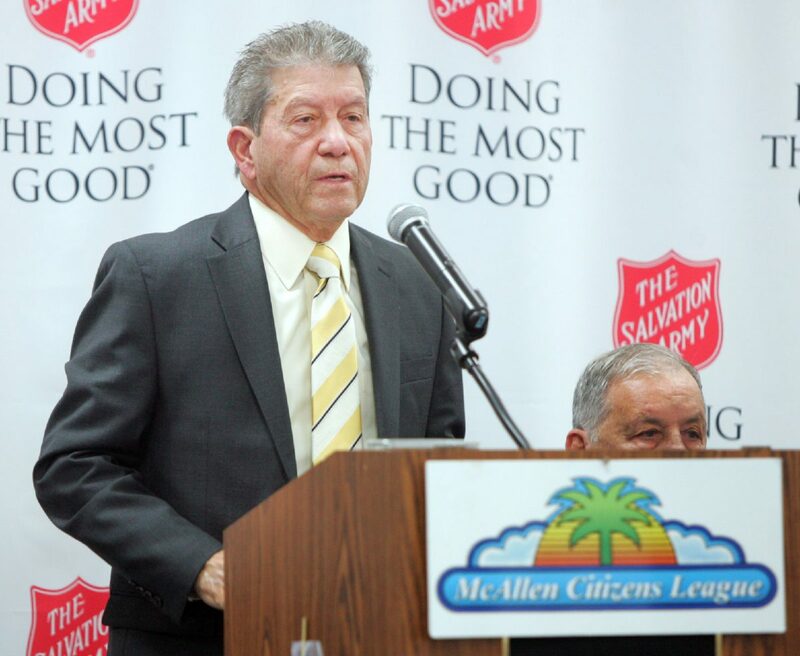 Hidalgo District Attorney candidate Rene Guerra speaks during a candidate forum at the Salvation Army Center Thursday, Jan. 25, 2018, in McAllen. Hidalgo District Attorney candidate Ricardo Rodriguez looks over at his opponent Rene Guerra during a candidate forum at the Salvation Army Center Thursday, Jan. 25, 2018, in McAllen. >> $10,000 from the Border Health Political Action Committee, which contributed the same amount in 2016. >> $10,000 from Linebarger Goggan Blair & Sampson, an Austin-based law firm that works as the collections agency for counties nationwide, including Hidalgo County. >> $9,000 from the Mission-based Law Office of Rodolfo Canche Jr.
>> $5,000 from both the Law Office of Jose A. Ramirez and attorney Mauro Barreiro. >> $5,000 from Greg Lamantia of L&F Distributors. >> $5,000 from Wilfredo and Nancy Garcia of Mission, the former being a well-known case-runner who amassed a fortune by soliciting clients for personal-injury lawyers. >> $4,000 from Mailit Ltd. Co. of Mission. Guerra, on the other hand, received funds from four donors in 2017 — none are part of the county’s legal community. His two donors during the most recent filing period, covering July through December 2017, were a mailman who contributed $100 and a rancher who contributed $800, according to his report. In addition, Guerra received $100 from Mike Guarino, a friend and former Galveston County DA, during the January through June 2017 filing period; and $1,000 from McAllen music store owner Jim Melhart. During a candidate forum in late January, Guerra said he didn’t take the race “lightly” and called himself a “low-funded” candidate. “I never wanted to go out and solicit high amounts of money from donors,” Guerra told The Monitor, maintaining that this has been a longstanding practice in his previous campaigns. In 2013, however, the year before Guerra lost to Rodriguez in the March 2014 Democratic primary election, Guerra raised approximately $92,000. Although this was still less than the nearly $135,700 Rodriguez raised in the second half of 2013 alone, Guerra received donations from numerous law firms, attorneys and politicians. Donations then included $2,000 from Weslaco-based Jones, Galligan, Key & Lozano LLP; $3,761.50 from Mission-based defense attorney Ricardo “Rick” Salinas; $5,000 from Hidalgo County Judge Ramon Garcia; and $12,000 from Precinct 3 Commissioner Joe M. Flores. Guerra attributed any reluctance from donors this election season to his opponent’s “vindictive” personality. The DA also said contributions do not influence “how someone is going to be treated.” Citing his three years in office, Rodriguez further maintained that his office remains “responsible to our duties” regardless of who or who does not contribute. The incumbent also didn’t mince words regarding his challenger’s fundraising. Guerra still has approximately $19,000 left to spend in political contributions, according to his Jan. 15 report, which he plans to invest in advertising. A bulk of that money comes from his unsuccessful 2014 run and a $10,000 loan he gave himself. He spent roughly $17,160 on political expenditures in 2017, which mostly consisted of purchasing newspaper ads, as well as campaign signs and stickers. Rodriguez paid a little more than $177,050 for political expenditures during the same year, with nearly 75 percent of that spending occurring in the second half of 2017. In addition to advertising expenses, it also included costs associated with hosting fundraisers, loan reimbursement payments and donations to community organizations. Rodriguez spent $10,000 on consulting services from Edinburg-based Carrera Communications, while Guerra has foregone the use of a campaign consultant. Rodriguez has nearly $29,500 in funds left, and has invested heavily in his own campaign, with $175,189 in outstanding loans, according to his Jan. 15 campaign finance report. His reports indicate that in addition to investing in his own campaign, family members have also loaned him money. For instance, in August 2017 he paid his uncle, Edinburg Municipal Court Judge Toribio “Terry” Palacios, $20,000 in loan repayment. 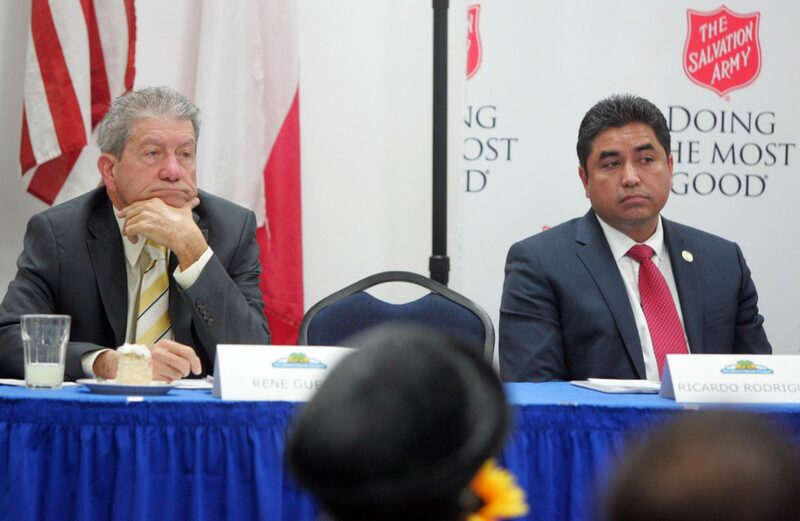 While Rodriguez may be riding high on the trial’s outcome, Guerra alluded to the hope that he can change public sentiment with campaign materials he has planned as the primary draws near. “I’ve got some bombshells to unload on him,” Guerra said.